I tested the Haskell hair dye. And most women like to color their hair with a permanent dye,in most casos.Seja to change the hair color, colorir ou cobrir cabelos brancos.Um dia desses eu estava procurando uma tintura de cabelo de boa qualidade e que não deixe os cabelos ressecados e sem vida e encontrei a tintura Haskell, a Excllusiv color. I tested the dye Haskell. I always try to use a dye or hair coloring that is not too little cockroach in the price and do not mess up my hair também.Pois many women buy a poor quality dye and later regret having bought. The dye Haskell comes in a beautiful and modern packaging also has beautiful cores.Como that brand is a very well known brand in the market, so I decided to risk it and test the product in my hair. It is important to read the instructions of how to use this product correctly and also make a locks test before applying to your hair to prevent breakage happen or all of your hair loss. Always perform a test strands before applying this product in your hair. damaged hair or many chemical should avoid applying this product, the ideal is to treat this hair, and when this is fully recovered using this produto.Falo because it is always important you make a strand test and see if it really your hair is in a position to apply a dye, than later regret or want to blame the manufacturer of hair dye. 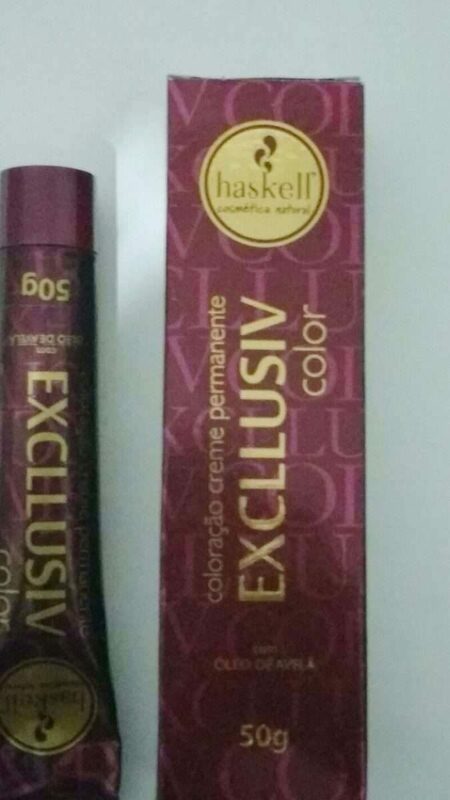 Remember that when applying a chemical, take a break of at least 15 days to apply a chemical compatible with this dye Haskell e.g..
style="color: #0000ff;" href="https://www.necessairedadiva.com.br/testei-a-mascara-oil-argan-da-marca-lola-adorei/" target="_blank" rel="noopener">Máscara óleo de argan da Lola. The permanent cream coloration Excllusiv Color Haskell promotes deep color, lasting, bright and uniform from root to tip, as well as a perfect coverage of gray hair. Enriched with hazelnut oil, provides intense hydration, nutrition and velvety touch. 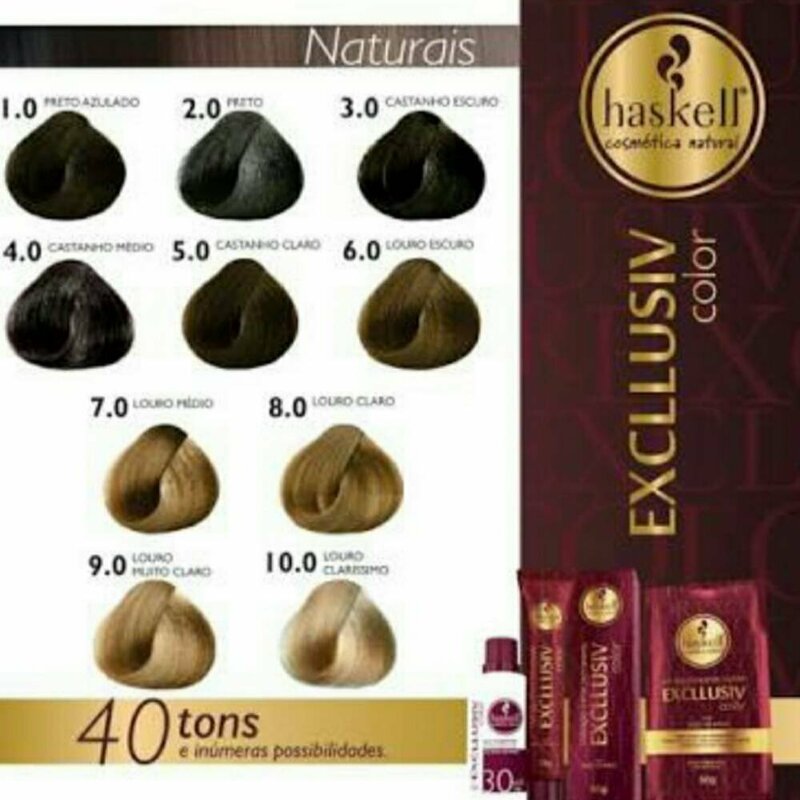 containing 40 cores, the coloring system Excllusiv Color Haskell also provides Powder Bleach and Water Light and fragrant consistency Oxygenated to offer the best in colorimetry to hair- Haskell. The product is constituted hazelnut oil, which gives shine and softness to hair. The hazelnut oil brings numerous benefits to hair and one of them is the powerful hydrating,brightness and treatment of wires. I used the colors 6,7 e 7,7 my hair up to change my look and say goodbye to red before used on a few strands. My opinion about this product. This product has a very nice smell and leaves the hair soft and much too bright, like that made a shock treatment or hydration. The almond oil leaves the action really well beautiful hair and recuperado.A great advantage of this dye is not cause dryness in the wires as the popular dyes. How to make the Magic smooth gradual sealing Eico. The price on average 20,50 real. I was impressed with the excellent quality of the product, great even! !My hair got beautiful glow,and also soft, ultra hydrated. I give scored top marks for that product because enjoyed this hair dye. Parabéns Haskell !! Previous PostPrevious Leaving my funny pictures- part 1. Next PostNext Subscribers Club VIP-attention!! The danger of lengthening eyelashes. Tip: where to buy good and cheap makeup-part 1. The best for your hair with Cicatri Renov Elseve. Kits progressive brushes from 54,89 real.